Brightwater Falls, now also called Turley Falls, is a gentle companion throughout the winter months when the greenery falls back and the fallen leaves and bare trees leave a clear view of its beauty. 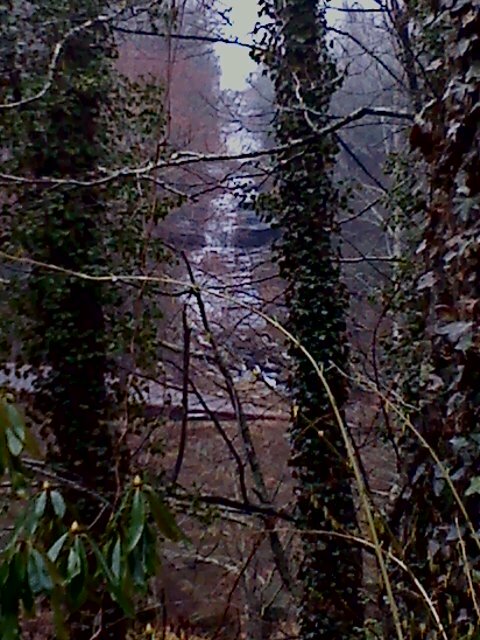 But I can hear this waterfall all year round from the peaceful spot of my back porch. Another favorite of mine is Looking Glass falls. The first waterfall I visited when I first came to the area, Looking Glass is right off the highway as you head up Mt. Pisgah in Pisgah National Forest, so it is very accessible. Some people go swimming at the foot of these falls in the summer months, but I love just sitting at the foot of the falls and listening to the water. What's your favorite place to take a walk on a summer day? Ever since Christy English picked up a fake sword in stage combat class at the age of fourteen, she has lived vicariously through the sword-wielding women of her imagination. Sometimes an actor, always a storyteller, Christy works happily with Sourcebooks Casablanca to bring the knife-throwing women of her novels to life. A banker by day and a writer by night, she loves to eat chocolate, drink too many soft drinks, and walk the mountain trails of her home in western North Carolina. Take a trip back to the American frontier! Here's JUST THE THING for Independence Day! Writing when you have no time. Linda Broday: TO LOVE A TEXAS RANGER ON SALE! Highland Hellion by Mary Wine is out now! In need of a flirty summer read? A Sky Full of Stars Launch & Giveaway! !